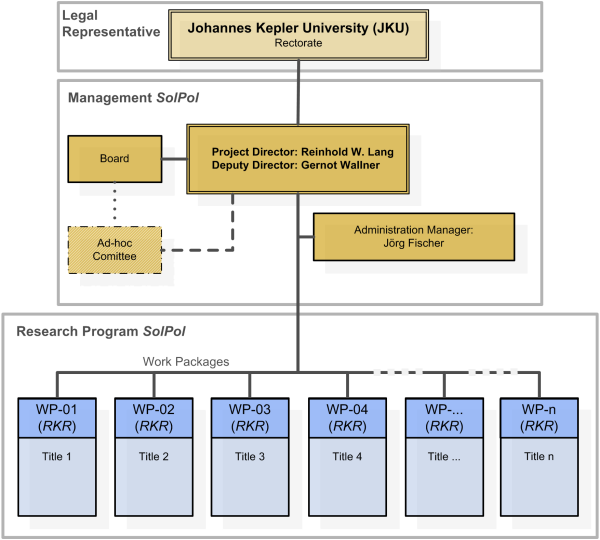 Legal responsibility for the Project will be assumed by the Johannes Kepler University (JKU) Linz, and the Project will be carried out as a cluster project with 'Third Party Project' status ('Drittmittelprojekt') according to the University Act 2002 (UG §27). In these functions, the Project Director will be supported by the Administration Manager who heads the Office of Administration, Finance and Controlling. The Project Director is also responsible for the quality of the research and development activities of the entire research programs. The Board will act as the central policy advisory body of the Project on all important issues concerning strategy and operations. It will meet at least three times a year. The board is made up of representatives from all company and scientific partners. To deal with complex or urgent matters or in case of conflicts, the Board may nominate several members to work in an Ad-hoc Committee with the Project Director to resolve such issues.